As the Collingwood Football Club meanders towards the end of yet another disappointing season it should be no shock that their form is still fluctuating. Last week against Richmond, a club that has become a modern day target of parody and ridicule, the Magpies themselves became the joke when they gave up a win in very easy fashion. 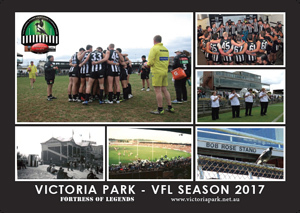 It looked as if the Pies would redeem themselves late in the final term as they hit the front but they then rolled over and let the struggling Tigers record a much needed win. It was just the most recent forgettable chapter in what is becoming a familiar pattern year on year. 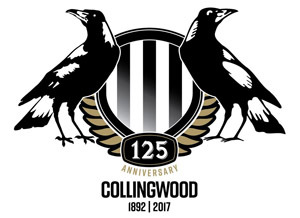 Collingwood hasn’t been a good team for 4 seasons now, and while there is hope for the future this season is a write off, once again. There’s still 3 games to be played though, and on Friday night the Pies will travel a few kilometers down the road to be hosted by the Western Bulldogs at Etihad Stadium. The Dogs are the buzz team of the AFL right now, the media love them, and so apparently do all the neutral fans. I say apparently because it seems as if there’s a fallacy that Dogs are everyone’s second team. I’m not going to speak for anyone else but they are far from that for me. These two have met once already this season and in that game the Magpies took the game right up to the favoured Dogs at the MCG before a stack of in game injuries cost the Pies any chance of winning. The Bulldogs recorded a 21 point win in a low scoring game as they continued to push for a top 4 spot. 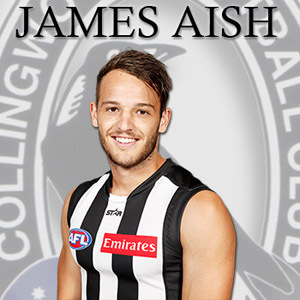 They are still an outside chance of getting one of those key double chance finals positions, but with a rather ironic (at least in Pies fans eyes) rash of injuries of late these Dogs may have to settle for a home elimination final. Is it over yet? That’s the question most Magpie fans are asking, and unfortunately it’s not. There’s still these 3 now meaningless games to play and the Pies players will have to find a way to self motivate themselves for this game. The Dogs are a defensive beast and with the current formation and production of an injury plagued Pies forward line this could get ugly. There is hope however, the Bulldogs do have a long injury list, maybe even longer and more talented than the Pies. Collingwood does have some players to call upon though with the VFL side yet again winning, this time their 10th win in a row. It’s remarkable that with all the injuries and problems that the senior side is having that the VFL Magpies are still winning. Tyson Goldsack was the standout in the latest win, and if he isn’t included in the seniors this week something more sinister is going on there. Youngsters Tom Phillips and Jordan De Goey were also great in the reserves win and will come under heavy consideration to return to the seniors. There may be good news on the injury front too with Darcy Moore pushing to return after missing one week and captain Scott Pendlebury adamant that he won’t be left out despite an ankle injury sustained late against Richmond. So the Pies will field a side of sorts against the Dogs, but as we’ve come to expect with this Magpies team it’s all about what level of effort they will bring to game day. If they bring their best, like they did against the Dogs the first time, they may well pull of an upset win. Anything less of an effort though and this could get ugly, well uglier for the men in black and white. The Western Bulldogs were one of the most talked about teams coming into season 2016 and they haven’t disappointed. Even with a recent run of extreme injuries they still sit in 7th spot with a 13-6 win/loss record. The Dogs injury problems did seem like they were going to derail their season, with back to back losses against Geelong and St Kilda, but a fighting 14 point win over North Melbourne last week has them back on track. With three very winnable games left (Pies, Bombers, Dockers) these Bulldogs still think they can finish top 4. The Western Bulldogs team defense is remarkable really. Coming into this season they were thought of as a primarily attacking team who basically outscored sides into submission. But this season it’s been completely different, with the Dogs conceding the third least amount of total points, with only the Cats and Swans better than them. It starts with the backline too, and Dale Morris is still leading this group after all these years. He acts as not only a leader of the defense but also as an on field coach, and allows the likes of Hamling, Roberts, Biggs, Johannisen and Wood to provide adequate rebounding. This week the Dogs backline will face off against one of the more listless forward lines going around, and that’s if Darcy Moore gets up. If he doesn’t it’s almost certainly the worst forward line in the AFL at the moment. Obviously the Pies forward line has been hit hard by injuries but the replacements aren’t standing up at all and the Bulldogs should dominate in this area. The Bulldogs midfield has some star names in it, yet it doesn’t exactly dominate teams on a weekly basis. The Dogs are in the middle of the pack for contested possessions and clearances but if they can get that ball to the outside they do remarkable damage to the opposition. They do have a high rate of inside forward 50 entries showing just how effective they are if you give them any time at all outside the packs. The loss of Mitch Wallis obviously hurts their midfield brigade but with Bontempelli and Liberatore leading the clearance count, they can match it with a Pies midfield that is struggling. The one area the Dogs may struggle is in the ruck this week, with Brodie Grundy starting to show his potential and dominating games like a player beyond his limited age and experience. This is where Collingwood need to dominate if they stand any chance at all. The Dogs forward line has been the topic that is usually brought up when speaking about this team’s future. The obvious target of debate is Tom Boyd, who the Bulldogs pulled away from GWS in a mega trade (and a mega contract). Boyd is only know starting to show what he is capable of but it will still be a few years before a definitive result of this trade will be known. They do struggle to put the score on the board though, with the worst inside 50 conversion rate of the top 8 sides by a long way. In fact they are the only top 8 side not ranked in the top half of the league for total points scored this season. They rely on a spread of goals to score with 4 scoring options standing out, Bontempelli, Redpath, Dickson and Stringer. The good news of the Bulldogs however is the Pies backline is as inconsistent as other areas of their game, and at Etihad allowed North Melbourne to score 124 points only a few weeks back. After a strong win last week the Western Bulldogs will go into this game knowing nothing but a win will keep them in top 4 contention. Realistically they have to win out from here on and hope the sides above them lose a few games. For this game against the Pies they are unlikely to make too many changes with Matt Suckling the most likely inclusion if he overcomes his most recent injury setback. That is a positive though, as for the previous few weeks they’ve lost players due to injuries in decent numbers, and quality. 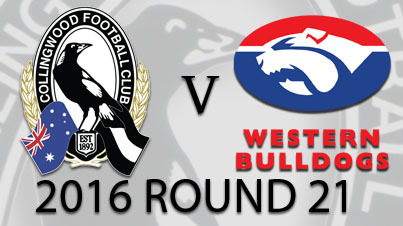 The Dogs should win this game if they have any ambitions of doing damage in the finals. Collingwood will go into this game as clear underdogs, and that’s not a shock given their recent form. The one advantage Collingwood may have this week is they run into a team that has been hit bu injuries just as hard as them. A lot may depend on final selection, with Pendlebury, Moore, Smith and Suckling all needing to pass fitness tests to play. If the Pies can get their captain and star young forward on the park they just may be able to outscore this defensively minded Dogs outfit.